O2 is the commercial brand of Telefonica UK Limited and is a leading digital communications company with the highest customer satisfaction for any mobile provider according to Ofcom. With over 23 million customers, O2 has over 400 retail stores and over 2,500 employees. During 2015, Qudini digital queue management was deployed into 487 O2 UK Stores. By Q3, Qudini was able to show clear improvements in customer experience and its impact on customer retention, with the number of stores walkouts reduced by 62%. Over a year across their stores, this stops £29M in potential New Contract revenue from walking out of the Telco retailers doors, creating an incredible new conversion opportunity. As O2 continuously evolves the level of service and advice offered to customers in its stores, it has employed ‘concierge’ staff to greet and assist customers as they enter the store. Previously these concierges used clipboards to manage the customers wanting service. This created a number of challenges because the clipboards could become scruffy and gave no visibility of colleagues’ activities as they served customers. The concierges were unable to provide customers with accurate information about when they would be seen. The O2 team wanted to deliver a solution that had the ability to manage customers at the point of entry and provide accurate data on wait times to meet customers’ needs. O2 concierges now use the Qudini Queuing System, including our Concierge app on their in-store host’s tablets. This helps them to manage customers as well as staff, and provide each customer with an accurate serve time calculation based on available resources. When the wait is long, customers can provide their mobile number and receive SMS updates about their turn. View further amazing results & graphs showing the drastic walkout reductions seen by O2. Qudini makes O2 staff more organised and efficient. As a result transaction times have reduced by 27%. 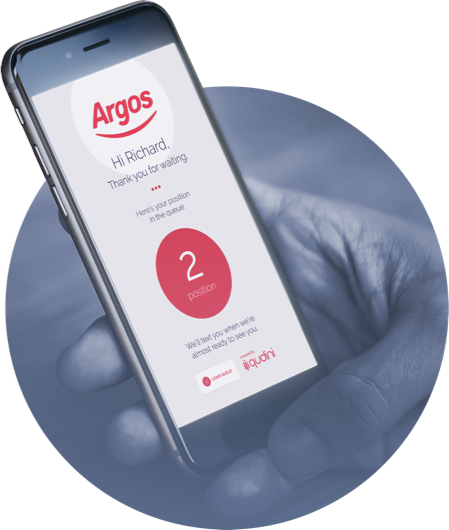 This creates enough time to serve an additional 75,000 customers a month across all stores. Qudini has helped O2’s NPS scores to reach an all time high, at consistently over 99%. The O2 head office now has access to invaluable business intelligence analytics on their stores’ footfall, performance and operations, helping to improve sales and efficiency across their entire estate. cost reduction from better data insights. Qudini technology enables your organisation to have full transparency of its in-store operations by providing superior access to business intelligence data.